It’s important to know that starting with Malwarebytes version 3, you have a choice between free and paid versions. The paid version is called Malwarebytes Pro. Cleverly, the free version is called Malwarebytes Free. In the image below you can see that I’m using the free version. If I wanted to switch to the paid version I could click the Upgrade Now button that appears in the upper right corner. The primary advantage of the paid version is that it offers real-time protection. This term means that Malwarebytes continuously scans for malware. The free version only scans for malware when one manually opens Malwarebytes and clicks the scan button. I use the free version since I have my proactive alert software installed on my Mac and know that it scans for malware every hour, which is good enough for me. If you’re one of my clients you should also have my proactive alert system installed on your Mac since I offer it for free. 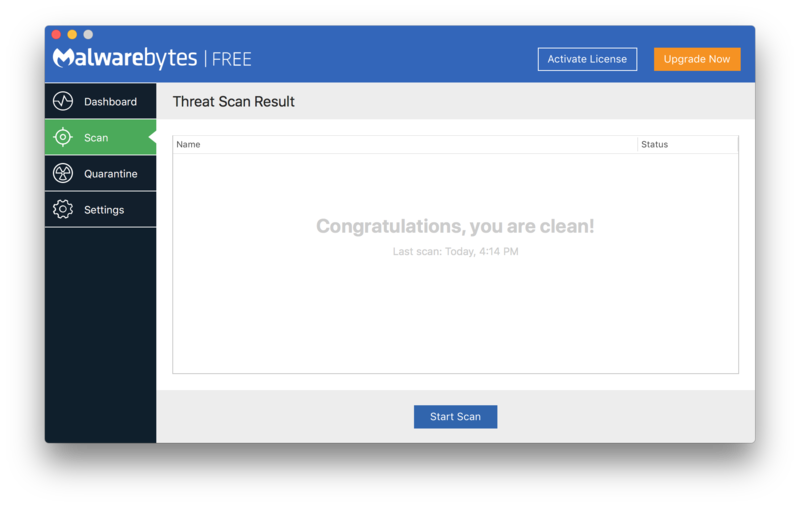 Thus, if you’re one of my clients you’re most likely fine with Malwarebytes Free. Regardless of whether you’re using Malwarebytes Free or Malwarebytes Pro, if you’re prompted to install an update, please do so. Updates are always free. Updates replace an older version of the application with a newer version. Thus, you should always update. Read more about mac, malwarebytes, update, upgrade.